With Contracts OnLine, you can securely review and sign your IBM agreements and contracts - all online. This web-based tool allows you to view completed documents, transparently accelerate the contract approval and signature process as well as improve contract management. Can I get copies of all my existing IBM contracts through Contracts OnLine? No, contracts not accepted through Contracts OnLine are not available online, however, on a case by case basis, it can be done. Can Contracts OnLine be used as a contract repository? All contracts processed through Contracts OnLine are contained in the application and available to authorized users. 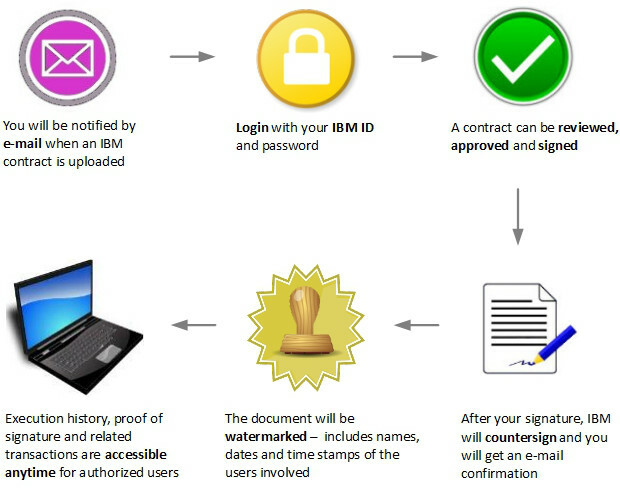 IBM Contracts not processed in the tool can be made available on request. What types of contracts can be managed in Contracts OnLine? All IBM contracts/agreements can be managed in the tool. It requires that all parties (Client/IBM/Business Partner) engaged in the contract process are authorized and set up as part of your approval/signature workflow. Is there a cost associated with using Contracts OnLine? No, Contracts OnLine is free for both IBM Clients and IBM Business Partners. It is limited to IBM contracts only. Contracts OnLine has many more features and capabilities. To arrange an appointment for a personal demo please contact us.